Mod adds atmosphere of GTA V to your Minecraft PE: gangs, money, guns, cars, coke, cops. Gang (Ballas, Vagos) - this mobs. ↘ To reload, press (^) when you are holding the ammunition. 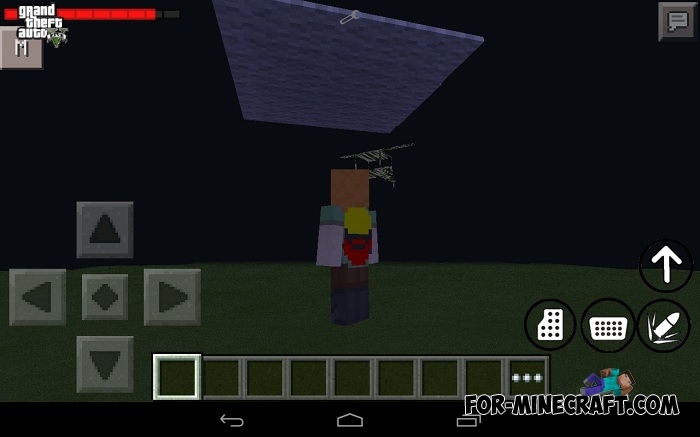 ↘ You can shoot using the machine gun from a combat helicopter. ↘ Sometimes drop out of bandits. You can use them to buy things from the mod! Also, you can sell diamonds, gold, etc. Shopping can be performed on a crafting table. If you killed a resident or hit a policeman, you get 1 star. Police will start to shoot at you. If you kill a cop, you get 2 stars. Police car with a cop will come to you. If you kill 4 policemen, you get 3 stars. Police helicopter arrives and shoots at you from a machine gun. If you kill 8 policemen, you get 4 stars! More of cops are attacking you! If you kill 12 police, you get a 5 star !! Helicopter throws a bomb at you !! If you kill 16 police, you get 6 stars !!! Wait tanks !!! Instead, of cops - the military will come !!! That's horrible. Also, there are Easter eggs! This command - the name of one of the mobs in MCPE. Mod is well suited for survival, especially in the citythen the gameplay takes the style of GTA! 2. Select GUI size: enter the folder "Big", "Medium", or "Small"
I hope this works but thanks for making this mod! I really hate this doing this over and over again! ?